eChemo go-live support team members Sonia Cuan, Kenny Lo, Kelly Shadid, Deidre D’Souza and Marita Quiazon are helping the Crown Princess Mary Cancer Centre go digital. The time-consuming task of writing paper medication orders is becoming a thing of the past for staff in Westmead Hospital’s Crown Princess Mary Cancer Centre. The Centre has successfully launched the first phase of electronic prescribing of chemotherapy using the ARIA system. Within the first week, more than 200 anti-cancer treatments were prescribed electronically for medical oncology outpatients. While patients wouldn’t notice any difference, the new way of working is more efficient and introduces a new capability that better supports continuous clinical quality improvement across Western Sydney Local Health District. “As more and more protocols become available for electronic prescribing, clinical staff at Westmead will start to see a standardised medication administration record uploaded as an ‘infusion therapy’ note in the electronic medical record,” explained Anne Caboche, Cancer Services operations manager. 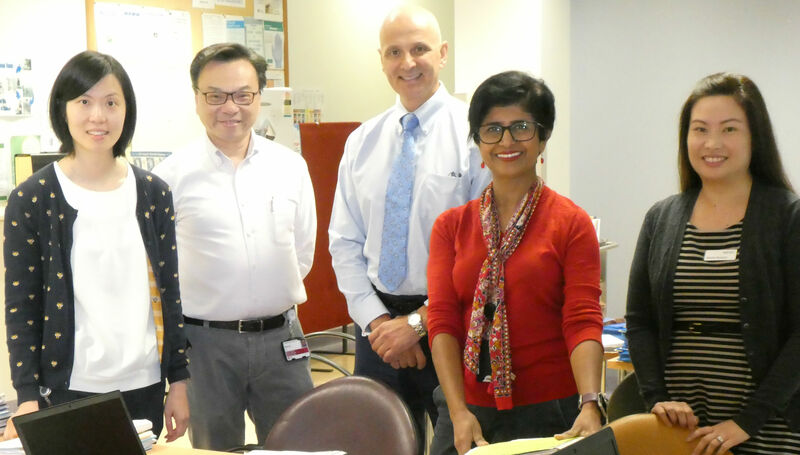 The inaugural eChemo write-up session at Westmead Hospital on Monday, March 18. The program is already used at Blacktown Hospital, though due to the size of Westmead Hospital and patient cohorts, additional planning was required to help with the implementation. “We’ve been very lucky to be able to leverage all of the lessons learned from the launch of eChemo at Blacktown Hospital,” Anne said. “Thanks to the collaboration and hard work of many staff from both sites, oncology prescribers at Westmead can already order from an impressive library of more than 235 complex order sets with the majority based on the national cancer treatment eviQ standards. Work now continues on phase 2 which will allow electronic prescribing of anti-cancer regimens for haematology outpatients.